Seven hundred forty pages. Four hundred fifty illustrations. Thirty contributors. Four nations. Thirty nine chapters. All about human powered recumbent tadpole tricycles … nothing else. The title of this book is Free on Three, intended to motivate one’s inner spirit of adventure, to get you out there seeing your planet from a whole new perspective. It’s amazing how the same territory you’ve witnessed for years in automobiles or on foot suddenly transforms into an entirely different world from the cockpit of a trike. So, what will you find within the pages of this unique book? Well, quite a lot of knowledge about tadpoles, that’s what! From who makes them and sells them, to how to choose the right one for your needs, to what it’s like riding a trike hundreds or even thousands of miles across the country. Once you finish reading the final page, you’ll have a comprehensive understanding of human powered recumbent tadpole tricycles. Whether an expert already, or just a greenhorn about to plunge in, you’ll learn things you never knew, you’ll become an expert on these three wheeled rigs, and you’ll be eager to head out into your own wild journey of discovery. Part ONE (The Ultimate Freedom Machine) consists of five introductory chapters to whet your whistle, thereby priming the essence of our primordial need for exploration and adventure. Trikes allow intrepid travelers to leave the car behind, while traveling many times faster than feet would ever allow. Peter Stull, owner of Bicycle Man in Alfred Station New York, penned the first concise piece that describes the unparalleled spirit of triking. Peter is an expert with trikes, and sells a complete line of tadpole tricycles … he’s not just a bike guy! Yours truly scribed the next article, which will detail all that you will find in the book. Up next comes an informative chapter written by Charles Coyne, publisher of Recumbent & Tandem Rider Magazine. He chats about how trikes have played an integral part of his magazine’s first ten years in business. Another well known journalist provides a few words in the next welcome chapter. Bryan Ball, creator of the world’s most widely read online recumbent website, Bent Rider, muses about how recumbent trikes have grown from nearly unknown status to the default recumbent design in the minds of many a cyclist. Wrapping up Part One is an emotionally laden masterpiece of tricycular brainwashing, which does its best to inject pure adrenaline into those triking veins of yours. If you believe that riding a tricycle is nothing more than basic transportation, intended only to accomplish certain necessary tasks of getting you from point A to point B, then just skip the next chapter because you’ll likely think the author has been inflicted with the madness of overly dramatic exhortation. Actually, it may be true, as I have most assuredly become a three wheeled fanatic. If you like the ideology I offer in Free on Three, then you’ll enjoy this whole book, which is overflowing with the same philosophy. Part TWO (Trike Tips From Tadpole Dealers) is packed full of wisdom from four dedicated tadpole trike dealers, and describes many things that all enthusiasts are hungry to know. First, Peter Stull is back to explain what’s necessary for choosing a unique tadpole trike that fits you just right, while serving your specific three wheeled needs. Next, Rolf Garthus, owner of Hostel Shoppe Recumbents in Stevens Point Wisconsin, discusses many important aspects of recumbent tricycling, and answers some frequently asked questions. Hostel Shoppe is a convenient and widely respected one-stop trike shop that offers assistance in person, online, or over the telephone. Then, Terry “Hoppy” Dean, owner of T.Ryx Recumbent Trikes in Escondido California, leads an informative talk about many facets of tadpoles, and discusses his own beginnings. Like quite a few trike companies, Hoppy believes that fossil fuels are extinct, which gave rise to his shop’s unique naming. The first section of the book is brought to a close by trike guru Ashley Guy, owner of the superbly stocked Utah Trikes, a well-known tadpole trike dealership that does significant business both at their shop and online. Ashley’s chapter discusses a number of necessary elements that any serious trike enthusiast needs to know. Part THREE (Inside The Major Manufacturers) takes you behind the scenes of some major trike manufacturers, including one pannier manufacturer and one ingenious mountain trike company that is now inactive. Taking the lead in part three is the Canadian company called Arkel, a good name to know if you are seeking cargo solutions on your trike for errands around town or treks around the world. Joe Kurmaskie describes many options that will carry your stuff in style on three wheels. Brian Gobrogge of Berserker Cycle Design steps up next to explain why the Berserker tadpole trike is a good choice for riders who want the maximum in bodily comfort, a luxury his company offers through the trike’s full suspension system. The 26 inch wheels also afford more ground clearance and allow for easier ingress and egress. Catrike then moves into the spotlight with its chapter written by Mark Egeland. Catrike’s extensive line of tadpole trikes are made in Winter Garden Florida, and have become a mainstay in the tadpole world. Here, you will learn the story of owner Paulo Camasmie, and how he started this famous trike business from humble beginnings. Trikes for a small planet are the next order of business, and we have a chapter by Ian Sims, founder and CEO of Greenspeed trikes from Australia. He eloquently offers his wisdom from over 20 years of designing trikes, with the feedback of thousands of customers, many of whom have toured for thousands of miles on Greenspeed trikes. From Australia, we move on to more northerly territory to visit Inspired Cycle Engineering, commonly abbreviated and known as ICE in the tadpole world. Ben Rotheway submits for our consideration and enjoyment the history of this premier trike company from Great Britain. Learn about ICE from its earliest times to the present, and see how a race car driver sparked the flame. The pursuit of perfection is what drives Trevor Innes, brilliant creator of perhaps the most sophisticated trike to be found, the sleek and visually pleasing Innesenti. Mike Davidson offers this story about Trevor’s carbon fiber three wheeler made one at a time to the highest standards in England. Check out this steed if looking for a true conversation starter. Kerrel Cycle is a story of a different sort. Imagine a tadpole trike that has the uncanny ability to traverse side hills through an unequaled suspension system that allows it to lean, thereby keeping the rider upright. Sean Kerrel masterminded such a vehicle, the amazing SK3 mountain trike, and tells the tale of its conception, construction, and current inactive status. Look into the mind of a master. Nearly all tadpole tricycles have a rear wheel power train, with the front wheels steering. One does not. The Sidewinder drives power to the front, while the rear wheel steers the trike, which allows for this incomparable trike to turn easily at 90 degrees, making it capable of turning in its own length. Michael Newhouse tells the story behind this stand-alone vehicle. Bringing to a close this section is the venerable TerraTrike, a world renowned company with a modest commencement in Kentwood Michigan. Jeff Yonker tells this story of a successful manufacturer that prides itself in being “part of the solution” to the world’s transportation difficulties. From a simple sketch on a napkin at a Christmas party, TerraTrike has grown to a world class trike leader. Step inside. Part FOUR (High Adventure On A Low Trike) is where we will need to settle in for some long term reading about four dedicated trike pilots. Find an easy chair, some spare time, and transport yourself into the wild world of cross country and life altering trike tales. Many of us use our trikes for local transport, relaxation, errands, and fun. Others, far fewer in number, choose the tadpole trike for other reasons. Two of the following four pilots came to trikes due to personal misfortune, and ended up making a significant difference in not only their own lives, but the lives of many others. The other two came to trikes with distance on their minds … lots of it. They departed on epic treks equal to what most people would only do in a high speed toxic automobile. In fact, most “normal” people would likely believe these extreme trike pilots to be living on the edge of reason, or perhaps beyond, depending on one’s point of view. Taking the lead, trike warrior Kyle Bryant tells of an ever challenging life through his heartwarming tale, Slaying The Ataxian Dragon, the true story about a currently incurable disease that takes the lives of countless innocent victims, often early in life. Only in his mid twenties, Kyle’s life may be nearing a premature conclusion, one that leaves him physically helpless in its wake. 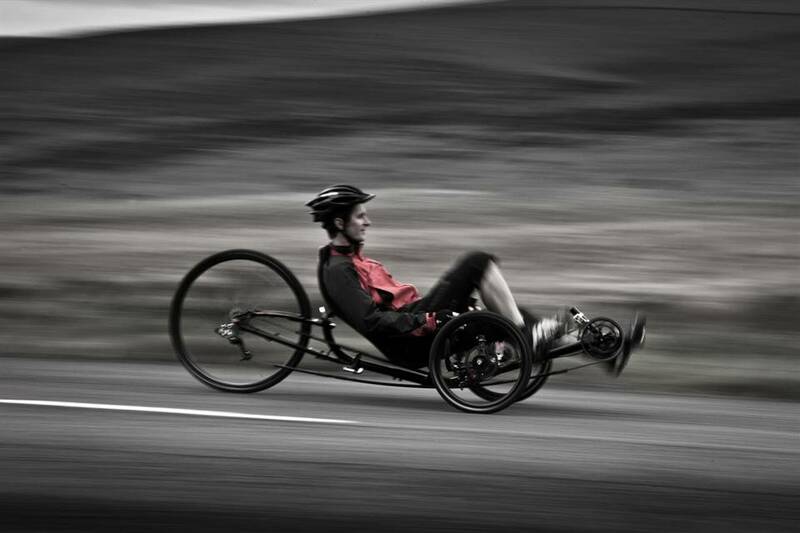 Iron man Kyle is using human powered recumbent tadpole trikes to make a difference, by bringing a world focus upon the crippling and deadly disease known as Friedreich’s ataxia. He has been the driving force behind hundreds of thousands of dollars donated towards research to find a cure. The New York Marathon is for runners on foot, or at least that’s what the past restrictions mandated. At 46, Denise Lanier suffers from Multiple Sclerosis, a disabling condition that grimly took her away from triathlons and bicycling a few years ago. In her story, Blazing A New Trail, she tells how a human powered recumbent tadpole tricycle has given her a new chance at life, and how she rode her trike in this prestigious east coast event after having been granted permission to enter on the trike as a reasonable accommodation for a disability. Denise is a teacher, reviewer of books, and an award-winning writer. In her early 50s, Janet Buckwalter scheduled three summers to ride a tadpole tricycle for 4,051 miles over the course of 81 days … from the Atlantic Ocean to the Pacific! Her story, Chasing The Dream, shares her joys, sorrows, and experiences during ten weeks in the seat of a trike. The tale is broken up into three phases, one for each summer. The story will give you the idea of what she went through, how she handled it, and why she loved everything that happened along the way. Her trike tale will encourage women who have been contemplating a long trike trip to finally get out there and give it a go. Part four of the book is concluded with The Great American Trike Tour, an epic endeavor mounted by naturalist, minimalist, and adventurer Dan Price. He lives in a tiny hobbit house he built himself, which is tucked into the side of a forested hill just outside the miniature town of Joseph Oregon. Dan is a unique fellow, who made a decision a few years back to ride a tadpole tricycle around the United States. He earns a modest income hand writing and illustrating the Moonlight Chronicles. In this book is his compelling tricycle odyssey in its entirety, supplemented by a few of his fascinating sketches of what he observed along the way. Part FIVE (Trike Pilot Profiles) features brief profiles of eleven people who love their trikes, from riding around town for fun and exercise, to riding across vast distances for the ultimate challenge. Included in this section are tiny tidbits of information, along with a few photographs, of: Rodney Schram (TerraTrike Zoomer); Gary Bunting (Catrike Road); Brian Stuart (ICE Adventure); Linda and William Newman (TerraTrike Zoomers); Steve Newbauer (Catrike Trail); Don Saito (ICE Qnt), Will Baird (T1X Suspended Trike); Norm Nieberlein (Catrike 700); Bob Shaver (Catrike Speed); and Adam Payne (Catrike Road). These are people with normal lives, working jobs, paying bills, and hoping for sunny days. What brings them all together in this section is their love of human powered recumbent tadpole tricycles and their spirits of adventure. The First Eleven Days recounts the first eleven days of the Death Valley Tricycle Expedition, which occurred in October and November of 2009 (37 days total). Adventuring On A Trike is designed to provide a few insights about using a human powered recumbent tadpole tricycle to ride long distances on a road system not designed for human powered humans. Topics like where to sleep, what to eat, how to pee, and why to even go on a trike adventure in the first place are discussed, along with many other important aspects of triking overland. To Trailer Or Not To Trailer probes the many pros and cons of towing a trike trailer cross country behind your trike. There are clearly loads of benefits to bringing everything but the kitchen sink in a trailer, but then again there are significant drawbacks too. This is wisdom only gained after actually towing a trailer day after day, mile after mile, mountain after mountain. Trip Tips offer up twenty-nine aspects of overland triking that may prove helpful to those heading out for the long haul. From talk of gearing to talk of hair length, check out these tips to see if any apply to you. Meet Wild Steve brings part six to a timely close. This short piece provides a fractured glimpse into who is behind the creation and production of the book. The “wild” part comes from a love of the wild natural world, clearly not as a result of any desire to engage in late night parties or be a social outcast. Part SEVEN (Tadpole Tricycle Resources) puts a wrap to everything, and is where you will find contact and viewing information for a whole slew of things, from trike manufacturers to dealers, and anything else that might be appropriate for human powered trike pilots like ourselves. Inspired Cycle Engineering closes out the manuscript with their 16 safety considerations while riding a human powered recumbent tadpole tricycle.